Stop Execution. Ctrl + C can be used when the context is unambiguous (when there is no text selected). Tab (to next script). Note: Tab to next script works only when you have a single Windows PowerShell tab open, or when you have more than one Windows PowerShell tab open, but the focus is in the Script Pane. Tab (to previous script). Note: Tab to previous script works when you have only one Windows PowerShell tab open, or if you have more than one Windows PowerShell tab open, and the focus is in the Script Pane. Use these keyboard shortcuts on Script Pane, when debugging a script. Note: You can also use the keyboard shortcuts designed for the Windows PowerShell console when you debug scripts in Windows PowerShell ISE. To use these shortcuts, you must type the shortcut in the Command Pane and press ENTER. 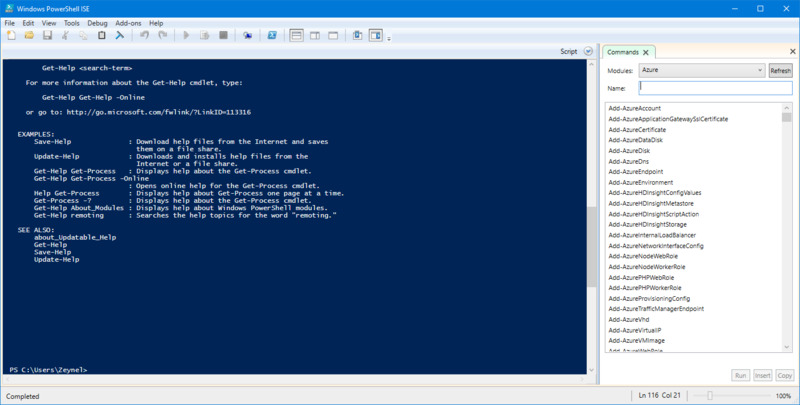 Windows PowerShell ISE allows users to write, test, run, and debug scripts in a Windows-based graphic user interface with features like multi-line editing, syntax coloring, selective execution, etc. Windows PowerShell ISE can be started by typing "Windows PowerShell ISE" in the Start Menu or typing powershell_ise.exe in the Run box. What is your favorite Windows PowerShell ISE hotkey? Do you have any useful tips for program? Let other users know below.